The zebra longwing (Heliconius charithonia) is a common resident of the Cockrell Butterfly Center (CBC). 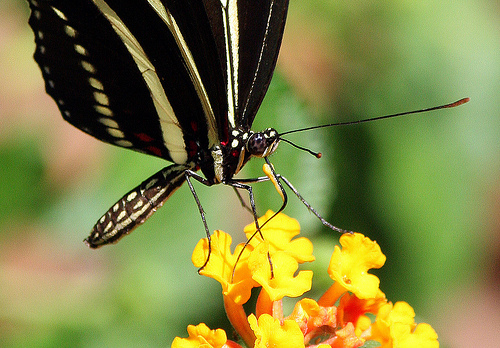 This butterfly is easily recognizable with boldly striped yellow and black wings. When visiting the CBC, you’ll often spot them sipping nectar from the flowers and nectar feeders or sunning themselves with their wings spread open. These butterflies have some unique features and behaviors that set them apart form the rest! Bright, contrasting warning colors are known as aposematic coloration. They indicate to potential predators of the “unprofitability” of a prey item. The bold yellow and black stripes on the zebra longwing serve as a warning signal to potential predators of the butterfly’s unpalatable and poisonous nature. Zebra longwing caterpillars feed on passion vine (passiflora) leaves and acquire some of their toxins, making them distasteful to predators. Bright, contrasting colors warn predators to stay away. Most butterflies can only sip fluids with their proboscis, most commonly flower nectar. Zebra longwings, on the other hand, also feed on pollen. They use their saliva to dissolve the pollen and take in its nutrients. Pollen, unlike nectar, contains proteins and is very nutritious. Pollen feeding is correlated with overall higher fitness. 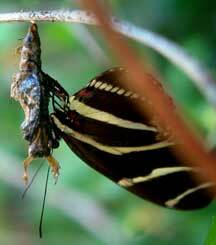 This diet allows zebra longwings to live longer (up to six months) and increases females’ egg production. You can see pollen on this zebra longwing’s proboscis. Feeding on pollen increases longevity. Male zebra longwings exhibit pupal mating, in which they will mate with a female before and immediately after she emerges from her chrysalis. Males will seek out a female pupae and will perch on it and guard it from competing males. Many males may fight for the opportunity to mate with the yet-to-emerge female. The successful male will insert his abdomen into the softening pupae and copulate with the female. Mating will continue as she emerges and dries her wings. The males will pass a nutrient-rich spermatophore to the female which reduces her attractiveness to future mates. 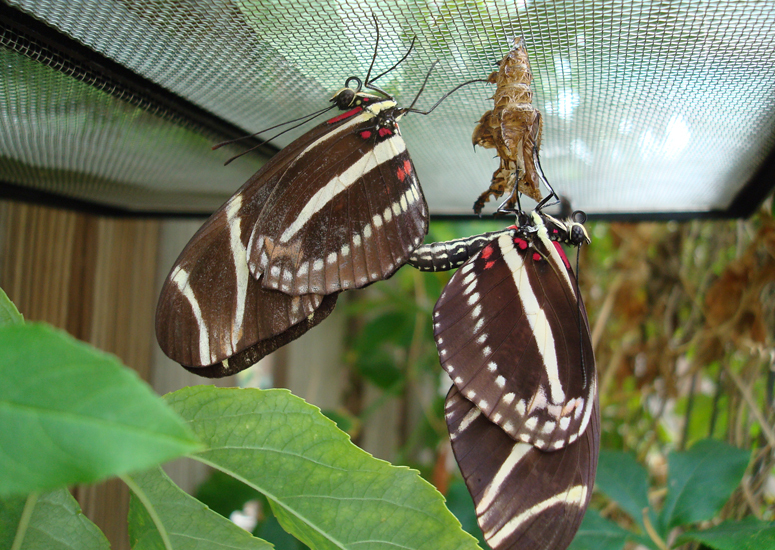 This male (at right) begins mating with the female before she has even emerged from her chrysalis. This mating pair shows the freshly emerged female still clinging to her chrysalis. Adult zebra longwings roost communally in groups of up to 60 individuals at night. They tend to return to the same roost on a nightly basis. In the late afternoon, zebras can be observed fluttering and basking near their roost site as they slowly gather together for the night. Roosting together provides protection from predators and retains warmth. 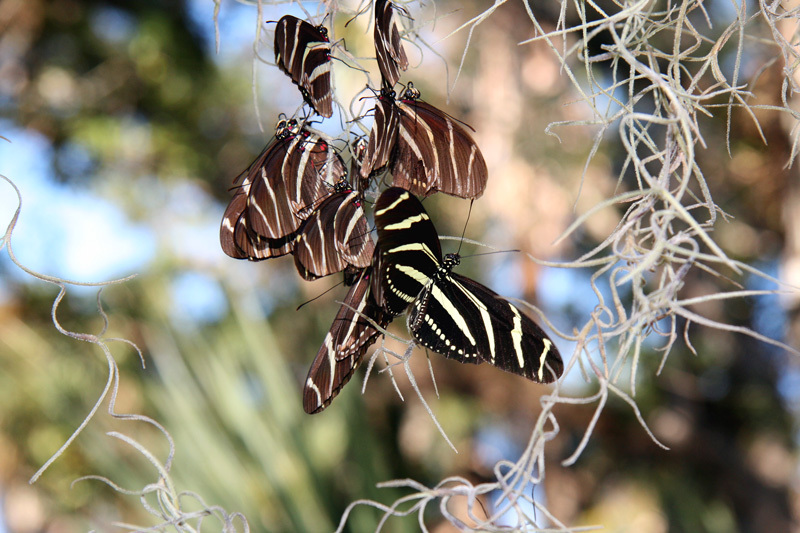 These zebra longwings are preparing for the night by roosting together for safety. So now you know! These beautiful, brightly colored butterflies are bad-tasting, and long-lived. They have unique mating habits and the snuggle together at night. Something to remember next time you visit the zebras at the CBC!